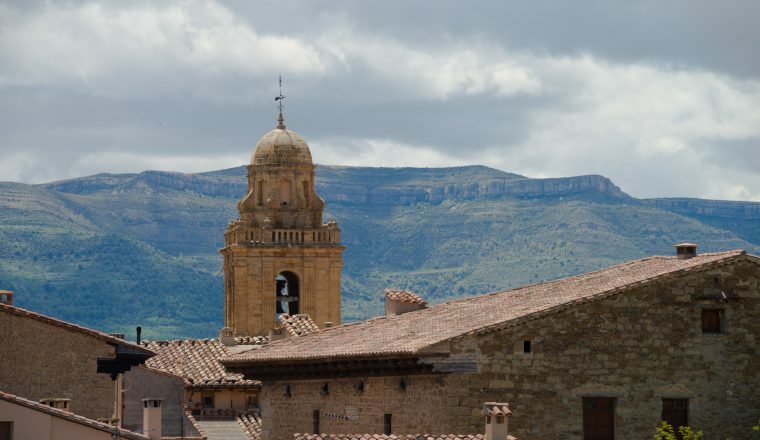 A self-guided walking holiday through a truly untouched region of Spain. In the Maestrazgo Area you will often have the impression of being the first person to set foot on these paths. Far from the main roads, this is a truly untouched land: villages lost in history, kilometres of walls of dry stone, country houses left to an uncertain fate in the middle of the countryside, and above all a refreshing tranquility. The population density is currently at 2.5 persons per square kilometre, which the European Union defines as deserted. Walks from 12 – 24 kilometres each day along rocky paths and with considerable height. Day six is a long walk that can be shortened using public bus or taxi. Options can be discussed at the briefing meeting on arrival. Dinner bed and breakfast based on two people sharing a room. First day transfer from Alcorisa to start point and last day transfer to Alcorisa. Transport to local start point. Daily from 1 April to 15 November, according to accommodation availability (except August and Easter Holidays). Molinos – Cuevas de Cañart – Ejulve – Montoro de Mezquita – Pitarque – Cañada de Benatanduz – Cantavieja – Mirambel. The route often follows way-marked long distance paths. You will walk on footpaths and drovers’ routes used for generations by villagers and farmers. The paths are of good quality but rough underfoot in places. There are no vertiginous sections. Welcome. Explore its little Gothic square and church (15th century). Accommodation and dinner. Visit to the Crystal Caverns (Grutas de Cristal). Hike up to the Templar village of Cuevas de Cañart following the GR 8. After leaving Cuevas de Cañart ascent with excellent views. End up beside Masía de La Torre polje. Twenty minute transfer to Molinos. Dinner and overnight in Molinos. On foot to Montoro de Mezquita village (10 inhabitants, above Vallore cliffs). This is the transition between the low and the high Maestrazgo: the lonely hillsides are covered densely with thyme, rosemary, lavender, and mixed forests of pine and oak. Walk through the ravine of the river Guadalopillo to Ejulve village, with its old flour mills now in ruins. 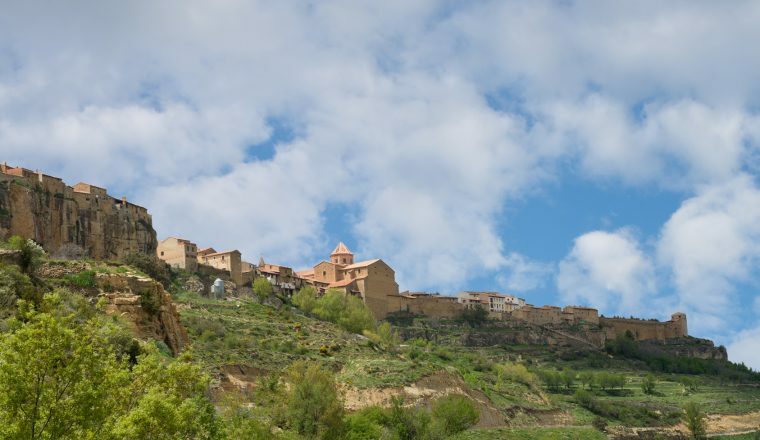 The walk starts on the pilgrimage route to the Hermitage of San Pedro de la Roqueta, an ascent the local villagers made after receiving rain after 7 years of drought. You cross mountain ranges running parallel with each other and intersected with little valleys and streams, with short but steep ascents and descents. Excellent scenery. Hike along the River Pitarque Ravine through a shady Mediterranean forest. Reach Pitarque Source after 1h.20 minutes. Maples, walnuts, hazel trees constitute one of best Mediterranean riverbank forest of the area. Pass a small defensive outpost, a memorial to the attacks by the maquis-resistance against Franco between 1949 and 1954. Return to follow the GR8 up a steep ascent (40 min) to the plateau. Go on towards de Santos Adones at 1625 m. You can see La Cañada village from here. 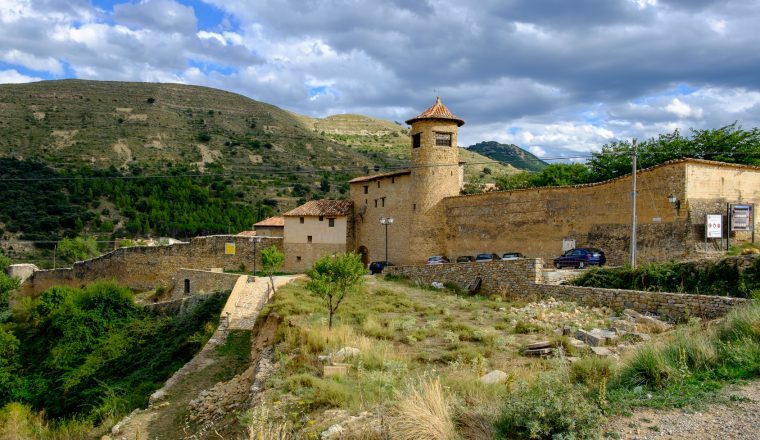 Visit to Cantavieja, a Templar village and stronghold of the soldier Ramón Cabrera, The Tiger of El Maestrazgo. The High Maestrazgo with altitude about 1800 m. Leave the village towards Capellania at 1725 m and 1h easy ascent. Go on to Cuarto Pelado. Landscape is pine forest and alpine grass. 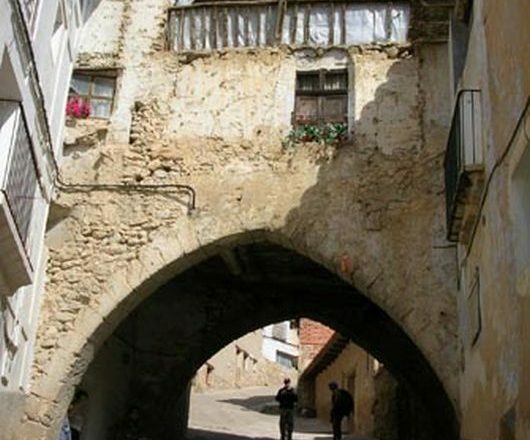 It is also a place of historic-artistic interest, with towns highlighted by their medieval architecture. The landscape this day is devoid of wood or forest as they were cut down in the XVI century to provide more pasture for sheep when the area was thriving on the wool trade. 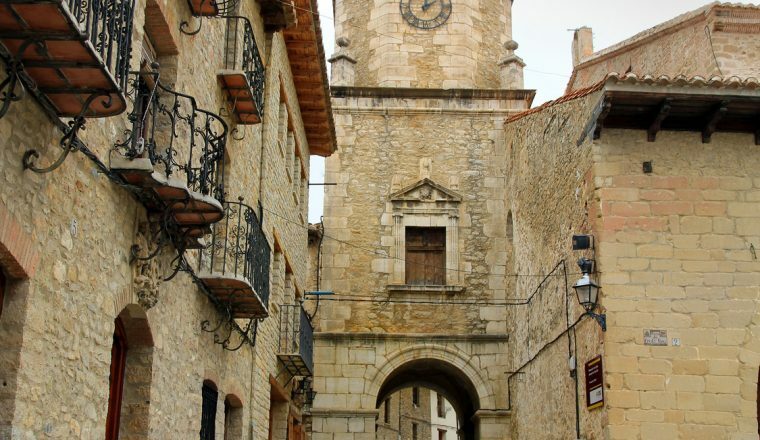 Your destination is Mirambel, a village full of beautiful medieval stone buildings, decorated with bold wooden eaves, a village which has often been used as a film set.